Are you on holiday in Maremma and the weather promises only rain? Have you organized everything to enjoy the crystal clear sea and the beaches of the coast of Grosseto but the sky is gray, windy and a bit 'too cold to show off your new bikini? You had in mind long walks in the woods, picnics in the open air and evenings watching the starry sky, but it has been raining for two days and the mood is falling dramatically? Do not be discouraged! The Maremma is a land rich in resources, full of places to visit and things to do at any time of the year and in all weather conditions. 1. Visit the many villages that dot this area: you can choose from the best known, such as Capalbio, Massa Marittima, Castiglione della Pescaia or Porto Ercole, or launch yourself to discover those more distant from the main tourist destinations, such as Giuncarico, Tatti, Campagnatico , Monetemerano, Rocchette di Fazio ... In no case you will be disappointed! 2. Space for culture: visit a museum. In Maremma there are for all tastes: this land has such an ancient and rich history, that almost every age has left testimonies and artistic masterpieces to be admired. From Prehistory to the Etruscans, from the Middle Ages, from the modern age to industrial archeology, to material culture and mines: the complete list of the Maremma Museums is here. 3. Are museums not enough for you? Visit a monument, a castle or a villa. 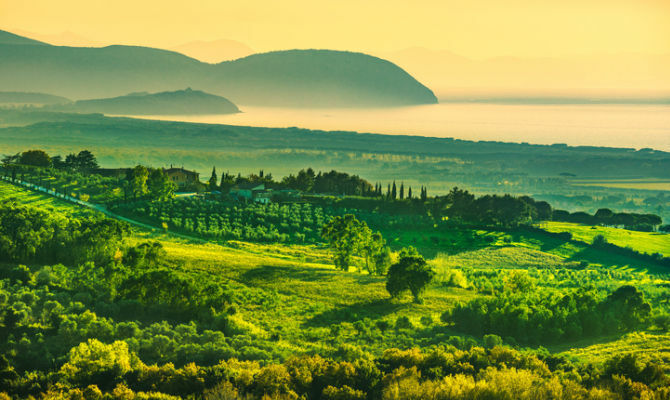 Also in this case the story was generous with the Maremma and the offer is rich and varied: from the Villa Sforzesca of Castell'Azzara to the Orsini Fortress of Sorano, and down down to the strong Spaniards of Monte Argentario. Or take a tour in one of the many temporary exhibitions that take place in almost all the municipalities of the Province: a constantly updated list can be found here. 4. Take a walk in the historic center of the provincial capital: the city of Grosseto has a lot to offer and we have told you here and here. So: umbrella, comfortable shoes and go, nose up! Or immerse yourself in the rarefied atmosphere of the Sanctuary of Frassine, near Monterotondo Marittimo, the Convent of the Passionists at the Argentario, or the community of Merigar or the Monastery of Siloe on Mount Amiata. 7. Wine lovers? Visit the wineries: whether you prefer white or red wine, taste the wines of the Maremma and discover the winemaking excellences, but also architectural of a territory that counts 3 Wine Roads (Monteregio di Massa Marittima, Montecucco and Colli di Maremma) and a long series of labels to try. 8. Discover the typical products. Many producers offer guided tours of companies and tastings of their products: oil, honey, cheese, salami, beer, bread and cakes. Many of these products are also found in the weekly markets, which are the perfect opportunity to immerse yourself in the daily life of the Maremma and shop for miles away! 9. Take advantage of the fresh to taste the specialties of Maremma cuisine, often not exactly suitable for summer temperatures: soups and vegetable soups, first of all the acquacotta, fresh pasta and stuffed pasta (how not to taste Maremma tortelli ?) and the game, with the wild boar as the main protagonist are the strong dishes of restaurants and festivals. 10. And after dinner? Why not go to the theater, the cinema or a concert? The Maremma summer is full of events for all tastes. The list can be consulted here.